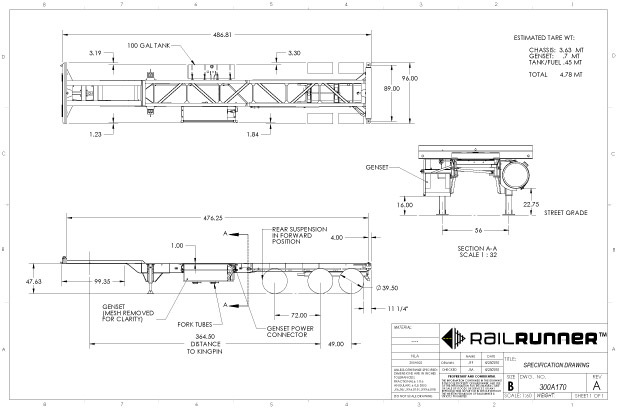 RailRunner®’s unique reefer chassis can carry both domestic and/or international reefer containers and operates both over the highway as well as on the rail, serving markets that have gone traditionally underserved due to lack of convenient, safe, and uninterrupted cold chain service. The reefer chassis design is based on the proven 40′ bi-modal chassis design and uniquely includes a removable side-mount genset and high capacity fuel tank that can supply a six-day uninterrupted cold chain, continuous monitoring of temperature, fuel supply and GPS location. For domestic operation reefer containers can be manufactured using “picture frame” refrigeration units reducing weight and investment costs while increasing cubic capacity of the container. Six-day Eco Power™ generator option with 20% greater fuel efficiency.